The English Language for a Better Life Project is implemented to provide an opportunity for rural students to access the English language course. August 31, 2018, marked as the end of the school year 2017-2018. CCAFO English Teacher Miss Sat Sokkea and Teacher-Secretary Miss Thea Panha introduce Chea Sophanny, who was dynamic and had good behavior among her classmates. Following is a short progress report about Sophanny. Photo: Sophanny was in her class of Family & Friend Level 1 at the CCAFO English School. Chea Sophanny is a grade 5 student at a local primary school. At her school, there is an English language program; but it has not been implemented regularly due to lack of English language teacher. “I am interested in learning English as a second language as my vision is to be the English teacher” she shared her opinion. When the CCAFO English School opened in mid-2015, Sophanny visited the school and took the entrance examination. Resulted from the test, she was placed in the beginner class by learning the book’s title “English for Children”. “More than three years, I can write, read and translate some sentences and words, if compared to before I joined the English language course. However, I keep learning this language as long as I can”, Sophanny said. “We recognize that Sophanny made a lot of progress on her English since she started her first class. She always does homework and keeps attending the course. She is a fast learner and an active student, therefore her knowledge is better” Teacher Sokkea and Teacher Panha said. By August 31, 2018, Sophanny was a student in a higher level “Family and Friend Level 1”. In order to reach Family & Friend Level 1, the student needs to join English for Children and then the Family & Friend Level Starter. CCAFO English Language School team wish her the best, and they believe that she will carry on her higher English level for the next school year 2018-2019. CCAFO English Language Center, a school which is located in the western, approximately 60 km away from Phnom Penh City, in Cambodia. The school provides a free course to children living in the remote area where they lack the opportunity to access the English class as a second language educational program. Ratana, who has been working as the CCAFO English Language Teacher and Administrator since early 2017. His qualification can teacher advance level. He shared the story of Duk Channay, an active student. Duk Channy, who is 10 years old, is currently a grade 3 students of Brochum Met Primary School that it is located in his community. 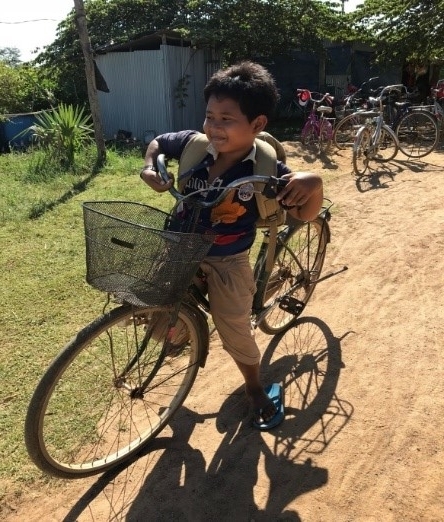 Channy lives in Pong Teok Village, Peang Lvea Commune, Oudong District, Kampong Speu Province with his parents who the father is a farmer and mother is a grocery seller. He is the fourth son in the family. One day in early 2017, his primary school teacher introduced the CCAFO English School and encouraged him to join the English language course, which later on, he made the entrance test and was placed to the Family and Friend level starter class, that the class was taught by Teacher Ratana. When we asked why he likes to join the English language course? Channy stated that “when I knew about this English language school opens for giving the opportunity to children in my community to learn the language, I was so excited to hear about it so I took the chance to study. I wanted to be the English teacher when I am an adult”. “I recognize that Channy has gained better Basic English language, and he can foresee that Channy will reach his vision as an English teacher if he keeps learning and remain the active student.” Ratana said. Teachers and management team pays close attention regarding the performance and information of every student studying at the CCAFO English Center. It is their purpose not only providing English language course but also find the way to help improve the academic condition in the area, as well as to ensure that the students are doing well while they are at the school. Chin Heng is a teacher, who has been working as the CCAF English Language Teacher after setting up this center. Heng wishes to introduce Choun Chantheoun, who has been studying the English language with him since early 2017. Chantheoun is seven years old and she is studying grade 1 at Toul Tmey Primary School. 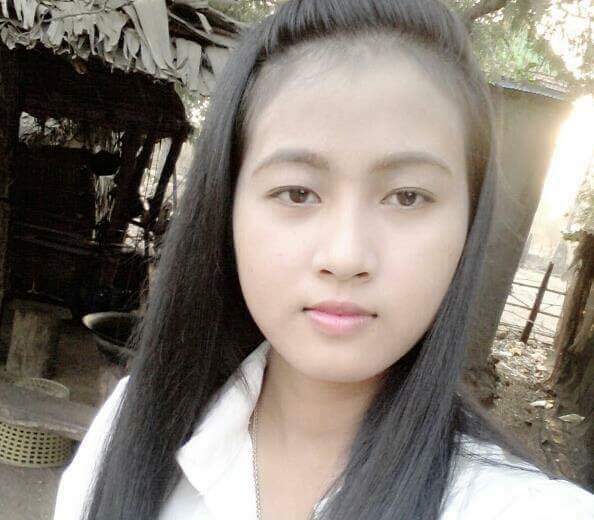 She lives in Kandal Village, Peang Lvea Commune, Oudong District, Kampong Speu Province. She is the middle child among the three siblings and her parents are factory workers. Her family living condition in poverty category 1 in the village. At one time prior to joining the English language course in early 2017, her friend introduced Chantheoun the CCAF English Language Center. With curiosity, love, and passion to learn the foreign language, she approached the staff and through the entrance examination, she was given the opportunity to be an English Language student. As a grade 1 student, Chanheoun studies in the morning (from 7:00 AM to 11:00 AM) and after school, she usually, travels by her bicycle to the English Language Center. Chantheoun is studying the English language through Family and Friend Level Starter, which she has passed the English for Children. According to the attendance record, Chantheoun is one of the active English language students. “Both her attendance and performance are great. She always shows up at the class on time. She can read and write a lot of words in English. Her handwriting is also clear and better if compared to some of her classmates who are at the same level of her age”, Chin Heng said. Resulted from the knowledge July 2018 test record score, she made 60/100. It shows that she gains better knowledge if compared to prior to joining the course. Chin Heng observed that during the class period, Chantheoun always be quiet and carefully listen to the teacher. Most importantly, she has never missed any homework and always returned with the completed homework. She has a vision that she wants to be the English language teacher for children in the communities. Chin Heng and all his students would like to say “Thank You” to all funders for supporting this school. The information in this case study given the verbal agreement of Choun Chantheoun.